We have several reasons to thank Kenneth Grahame for giving us The Wind in the Willows. First, at the time of writing (1908), England is at its apex. The political map of the world is awash in British Imperial red. This feeling of calm and wellbeing seeps into every stream and rivulet of Wild Wood and Surrounding Country. Secondly, in his position as bank secretary at the Bank of England, a ‘socialist lunatic’ fires three shots at him. All of them miss, but this traumatic incident is the impetus for his retreat into the country and into a fictional world. Finally, Grahame works out the details of his book by telling bedtime stories to his son Alistair, also known as Mouse. (Harvey Lecture, June 19). At the very beginning of my edition of The Wind in the Willows is a beautiful two-page map of Wild Wood and Surrounding Country. 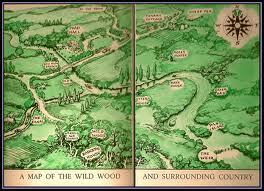 While it is an entirely separate animal world, we can venture into Wild Wood because we have a map showing the idyllic English countryside. The map maker outlines the objects in black and provides a large compass, which continues the illusion that this is a real place. The illustrator colours the map in varying depths of green. The watercolour medium allows the greens to soften and blend, rather dreamily, into a pleasant wash. Green represents nature, new beginnings, and freshness; these are all aspects Grahame wants to address in his book. Notice that there is little outside influence in this map. It is a self-contained world, sufficient unto itself. The outside world is mentioned, fleetingly, as “The Town” and is on the upper edge of the map, outside of the general perspective. We see each animal (Badger, Mole, Rat, Otter, and Toad) in his setting. Toad is motoring in his car, Otter is swimming, Mole and Badger are standing outside their homes. We see the barge—is that the Washer Woman?—hinting at adventure to come. 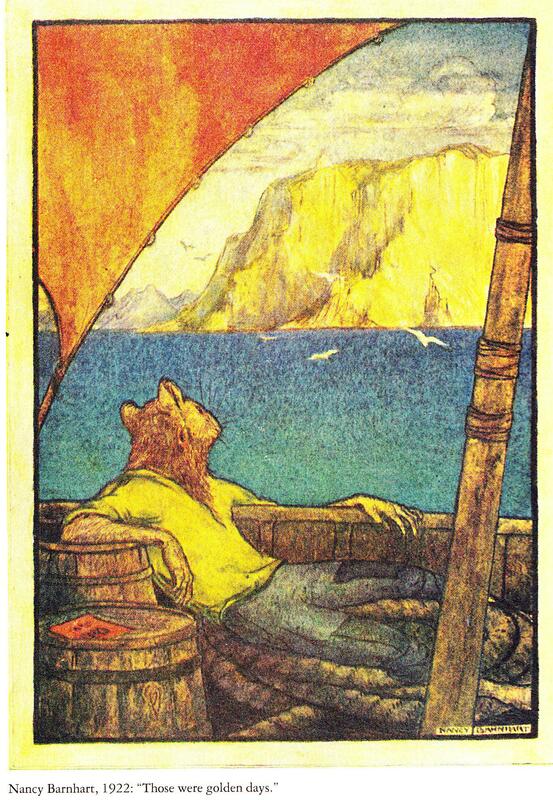 We see Rat and Mole sculling on Ratty’s boat, but we do not see the weasels, ferrets, and stoats fighting at Toad Hall. That would be too unpleasant to contemplate in this pastoral view of the world. Although Wild Wood is but a small part of the world, it figures largely in the River-Bankers’ lives, so much so that the mapmaker names his map for this section of the world. 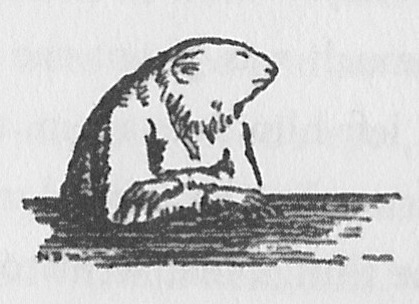 Rat describes the inhabitants there as being “all right in a way—I’m very good friends with them—pass the time of day when we meet, and all that—but they break out sometimes…you can’t really trust them, and that’s the fact” (Grahame 19). No individual weasel or stoat has a name; we know them as members of a collective. Because we do not know them, it is easier to objectify and demonize them. Mary Louise Pratt describes how Linnaeus’s systematizing of nature categorizes “homo sapiens and homo monstrosus” (32). Homo sapiens are divided into six categories: Wild Man, American, European, Asiatic, African, and Monster. In the case of Wild Wood, the stoats and weasels are the Socialist Lunatics who create anarchy at Toad Hall. Rat, Mole, Otter, Toad, and Badger are the named “Europeans” against whom the “Monster” stoats and weasels are compared. This creates their feeling of superiority and ownership. They are the landowners who live in comfort as members of the aristocracy. We … coasted up the Adriatic, its shores swimming in an atmosphere of amber, rose, and aquamarine; we lay in wide land-locked harbours, we roamed through ancient and noble cities, until at last one morning, as the sun rose royally behind us, we rode into Venice down a path of gold (Grahame 219). Mole turned his talk to the harvest…the towering wagons…the reddening apples…the distilling of cordials; till by easy stages such as these he reached mid-winter, its hearty joys and its snug home life, and then he became simply lyrical. By degrees the Rat began to sit up and to join in. His dull eyes brightened, and he lost some of his listening air. (Grahame 231). Ratty’s gentry masculinity requires that he obey the call of duty and the call of the land. He may be an armchair traveller; he may be a wayfarer in his mind and in his poetry, but he simply must stay within the bounds of Wild Wood and tend to matters of hearth, home, and country. Everything that matters lies within the borders of the map. Great opening, but be sure to cite your sources for the biographical material on Grahame – you can cite Marcus Harvey, if he was your source. Also, maybe state what Grahame’s traumatic incident was? The rest of the post is fantastic! Wow Nancy this looks great! The way you opened up your topic grabbed my attention right away. I also think your use of image is working very well with your content and text.